Welcome to my blog about downsizing, a revision of my HyProCure Stent in my Subtalar Joint of my left foot from a size 6 to a size 5 stent. The purpose of the revision was to release my joint held by the stent a little bit by using a smaller stent in order to eliminate painful Lateral Column Overload of my left foot and to allow for a little more natural pronation. 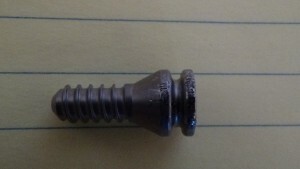 In other words, the size 6 stent was holding my foot in too much supination and not giving enough through my transverse arch to rock through the base of my big toe in the push off phase of my gait. With the lateral column overload, I was constantly sore under my fifth metatarsal along with pain in my peroneal tendons coursing around my cuboid bone. Even though my prior HyProCure blogs discuss success at that time and I was pain free, these symptoms manifested this year once I really was walking 1-2 miles at a time. 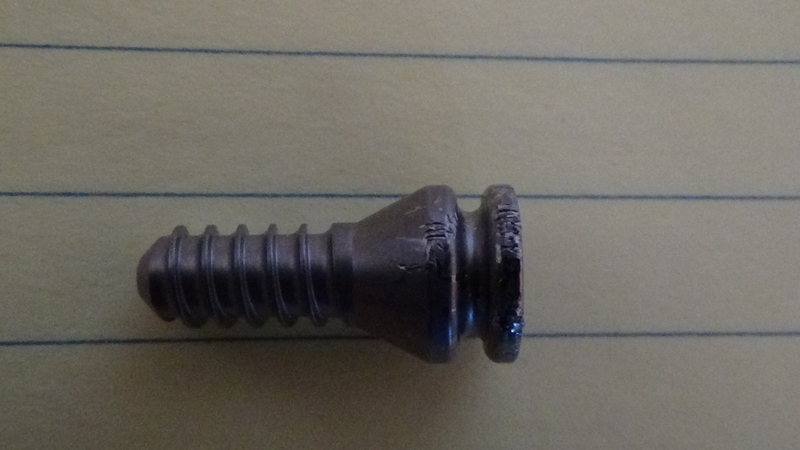 This blog then continues to share the bio-mechanical issues I’ve had during these past 2 months since the revision surgery affecting my opposite right leg. HyProCure aka Extraosseous Talotarsal stabilization is a medical implant product patented and produced by GraMedica Corporation. 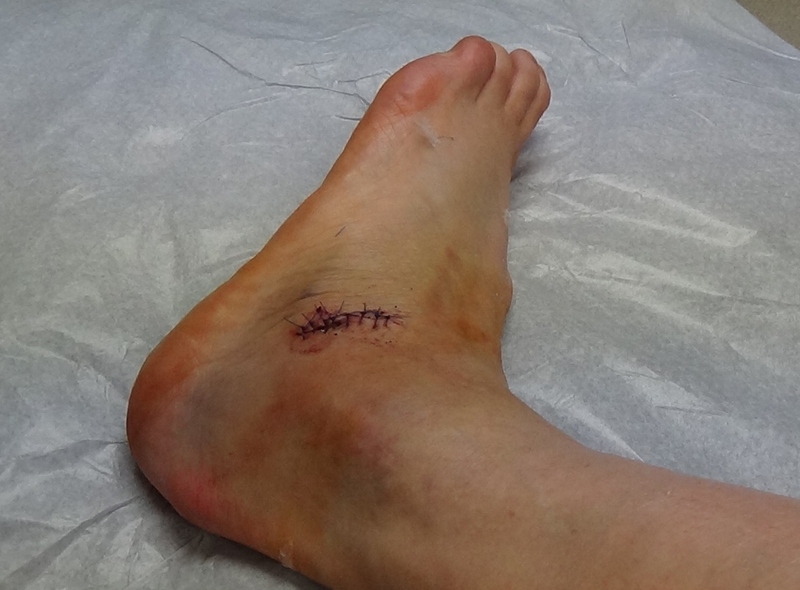 For new readers to this blog, please see the beginning of this HyProCure Category for my first surgery blog and see the beginning of this Subtalar Joint Category for the beginning of the story pertaining to the instability of Talus over Calcaneus(Heel) Bones in my left foot. For my ongoing readers, this blog picks up where I left off in my last blog which was a successful healing from my prior Endoscopic Gastroc Recession Surgery also done by Dr. Gent back on 12-30-14. August 26th, 2015 – Here is my YouTube video of Dr. Gent, DPM and myself in the pre-op for my surgery at the Pacific Surgical Center in Poulsbo, WA. 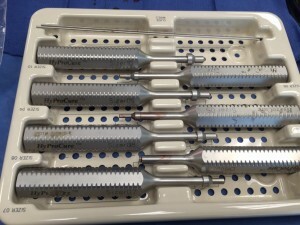 Here are photos of the surgical incision and a photo of the HyProCure Trial Sizing Instruments. The surgical incision was made right over the prior scar. (Click on photos to enlarge) The number 5 sizing instrument was used after the #6 size stent was taken out. The surgery took less than an hour from start to finish with general anesthesia. Over the next few days, I stayed busy in the hotel writing prior blogs and then I saw my doctor for my first post op appointment which was 5 days after the surgery. By this time, I was putting full weight into my foot while standing in the splint. I only had taken one dose of narcotic pain medication the day after the surgery and then only a few Tylenols with my 5mg Diazepam per night to help me sleep for the first 4 days. I call this one of the most uneventful post op surgical experiences. I found it extremely easy. I used my Aircast Cryo/Cuff Cold ankle/foot wrap at night around my foot while I slept with it elevated. August 31st, 2015 -Dr. Gent took the splint off and examined my foot as pictured on the left. It had very minimal swelling and just some bruising from the surgery. He re-wrapped it with light padding and an ace wrap and I walked out of his office in just a post op shoe. Here is my YouTube video at my 5 day post op appointment with Dr. Gent, DPM in his office at Kitsap Foot and Ankle Clinic. The video has discussion about all I’ve done to my left leg and foot and the wonderful results I have had these past 3 years of surgeries with Dr. Gent and my concurrent orthopedic surgeon, Dr. Main at Midwest Bone and Joint Center who specialized in the Proximal Tibiofibular Syndesmosis Arthrex Stabilization while Dr. Gent had done the distal Ankle Syndesmosis Arthrex Stabilization. My left lower leg has been transformed from a hard and swollen leg and ankle that lacked dorsiflexion and the ability to walk correctly to a wonderful non-painful leg/ankle. Now with the reduction of the stent size with this surgery, my arch is now more normal and natural. I felt an immediate difference from the moment I first put weight on it after the surgery once the numbing had worn off. I left his office and began my travel back to Idaho. I was by myself since my sister had already flown home from Seattle to get back to work. It was my left foot so I had no problem driving and by this time swelling was staying down. I stayed in the post op shoe for another 5 days and then I transitioned to my tennis shoe with an ace wrap around my ankle to support the surgical site. Sept. 10th, 2015 – I returned to see Dr. Gent to have my stitches taken out. My husband made the trip with me because he had a simultaneous business educational seminar to attend in the Seattle Vicinity. The next day I was able to have some time shopping in the mall and walked as much as I was able before resting my foot. This downsize surgery post op was extremely easy compared to when the first stent was put in my foot back in November 2013. Stabilizing my subtalar joint/arch with the first surgery simply took more time for the body to adjust. 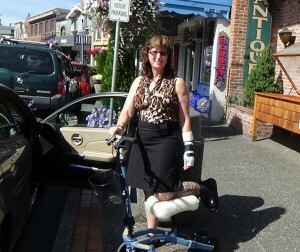 I was not able to enjoy walking in a store till at least 4-6 weeks post op at that time. 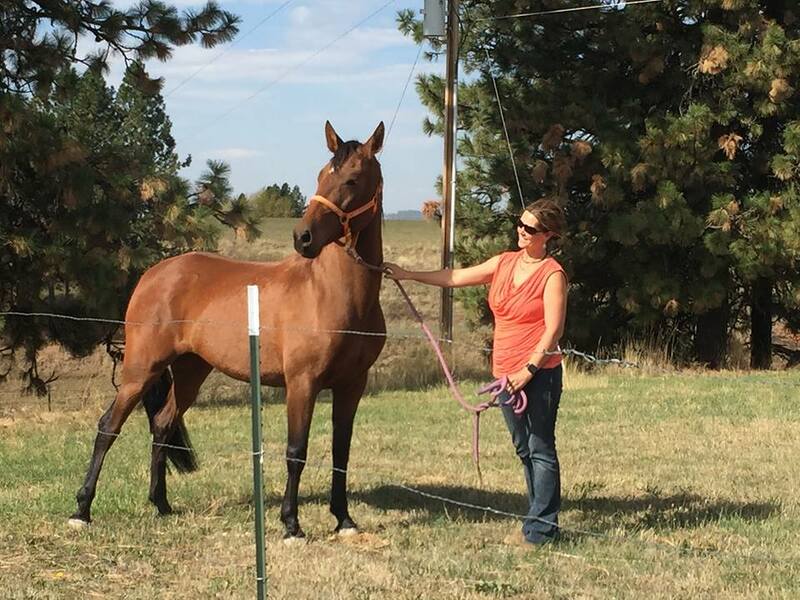 Sept. 28th, 2015 – I purchased my new horse in Sisters, Oregon as pictured here. For new readers to my blog, please see my prior Spiritual Journey Memorial Tribute Blog regarding the loss of my prior horse in July 2015. 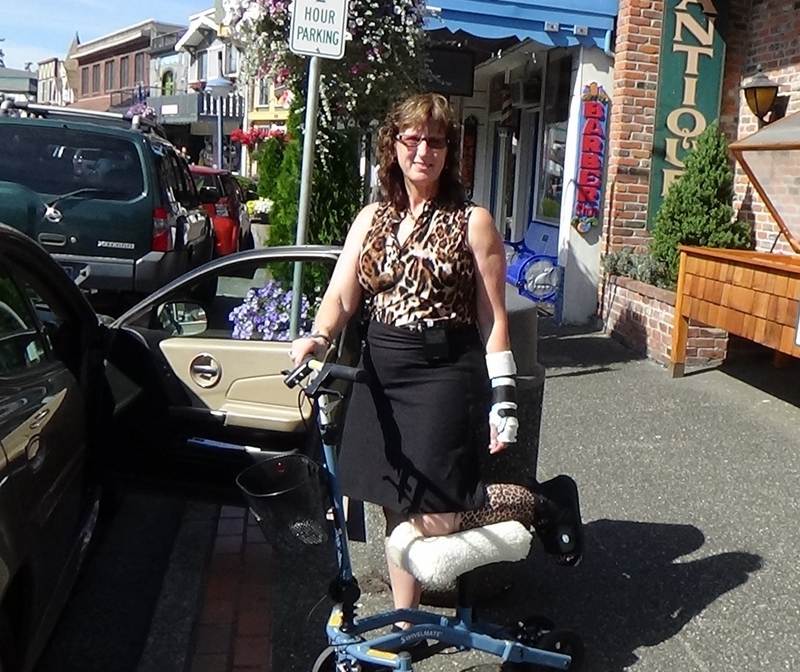 From Oregon, my husband and I traveled to the Seattle Vicinity for his next day business seminar and for me to have another followup appointment at Kitsap Foot and Ankle Clinic in Bremerton, WA. Sept. 29th, 2015 – I saw Dr. Gent and he was very pleased with my excellent recovery and healing now 5 weeks since the surgery. He took x-rays to confirm the position of the stent in my foot and all was well. 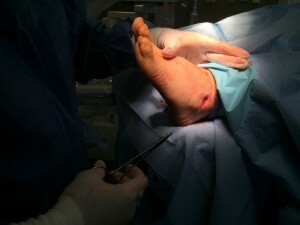 The first 4 weeks after this surgery it is very important to not twist the foot and only walk on level type of ground. The soft tissues are healing around the stent during this time to help hold it in place. I had been very careful. By this time, it had become obvious to me and to my physical therapists that my right foot would also need to be downsized too. Dr. Gent and I discussed this issue because the change of the arch on my left foot, even though positive in and of itself, was creating a major bio-mechanical change in my walking gait and adversely affecting my right ankle and leg all the way up and through my right SI joint ligaments. I now had one left foot standing more neutral and my right foot trying to drop in at the ankle to make up for the feeling of a longer leg when I felt very balanced before this surgery as shown in my prior blog when I walked 2.5 miles on a hiking trail. We are only talking about a few millimeters of change between stent sizes. Prior to this appointment, my right ankle pain was steady and increasing. Dr. Gent also did a diagnostic Lidocaine injection into my right ankle joint to ease the pain I was feeling which was very positive in giving relief. I continued to pay attention to what position my ankle was in when I felt pain and when I didn’t. When I would stand up over the foot and actually be more supinated like my left foot had been, the ankle pain was gone. When I didn’t to this, my ankle joint pain would come back. At this point, I came to realize that my right Glute Medius was not as strong as I thought and that I was not controlling the placement of my right leg the best I could at heel strike. But how could I? The stent reduction on the left foot allowed my arch to drop downward/more relaxed which in reality shortened my left leg making my right leg feel and actually be even longer. In compensating for all of this, my soft tissues and SI joint ligaments were strained over the right side of my sacrum/illium (pelvis) if I tried to have a normal stride in walking. I definitely was not a happy camper especially since a new horse was about to come home. Dr. Gent sincerely felt bad that I was going through all of this. Both sizes of the stent physically can work in my feet and up until this point in my journey the size 6 had done its job when it was put in 2 yrs ago. However, as I increased my awareness and training in finding strength in my hips and legs and truly started walking better overall and balanced underneath myself with the correction of the Short Leg Syndrome, that is when the feeling in my feet of over-correction (too large of HyProCure Stent) came to the light. With this surgery, it is a professionally trained judgement call with the trial sizing of the stents into the Sinus Tarsi canal; however, there is a subjective component to the surgery in how does the patient respond in the long run with adapting to the size of stent chosen by the surgeon. I had adapted to the size 6 but with consequences that were painful to live with; hence, Dr. Gent was willing to reduce my stent size and I’m forever thankful and grateful. This surgery is very minimally invasive and very easy for the surgeon to make a stent change or take it out all together with no real harm done to the foot. Oct. 3rd, 2015 – My new horse was delivered to me and this was the first time I was now back walking again on sloping land around the barn. It was very easy to stand over my left foot as I liked the natural balance and give of my arch; however, I must have liked it too much. I started to overload the medial (inner side) of my foot and my Posterior Tibial Tendon (PTT) wasn’t use to stretching this much and created some swelling as it coursed around my medial ankle affecting the Tarsal Tunnel and giving me burning nerve pain under the medial arch. My leg/foot had been in a supinated position for years leading up to the surgeries and there was no doubt that the PTT was being stressed with my new found foot flexibility aka more normal pronation as the new stent still was supporting the arch in the bones but the soft tissues around the medial side were aggravated. Oct. 7th, 2015 – I was taped by my physical therapist over my SI ligaments to help ease the irritation and give support to the soft tissues. After several days of taping, I proceeded to resurrect my Serola SI Belt to wear not for stability(as I felt plenty stable with my SI joint fixation) but to ease the discomfort I was having in the soft tissues over the joint. Oct. 12th, 2015 – I had talked to Dr. Gent by phone a few days earlier and he wanted me to continue with physical therapy regarding this foot. After describing all my dilemma to him, he shared one key word, “Lateral”, that has stuck in my head for the good. I made an effort to stand on my lateral foot as it had been before surgery and avoid hanging over the arch except when necessary in the gait cycle. He also ordered me up some Voltaren gel, a prescription local rub in anti-inflammatory. I used this to ease down the pain and my days began looking up. I paid attention to when I was sitting what my foot was doing and avoided letting it roll inward or becoming heavy over the medial column of the foot. I experimented with my low heel dress shoes and changed between them and my tennis shoes. With standing and walking in the heels,it helped me to contract upward my posterior tibialis muscle/tendon and strengthen it along with my calf muscles after 6 weeks of being in tennis shoes. In my entire life, I really am a person that is more comfortable in low heels rather than tennis shoes due to the design of my feet/legs. At my physical therapy appointment, Mark Bengtson,MPT owner of Pinnacle Physical Therapy helped to stretch and work my PTT and compared the arches of both feet. He had no doubt in what I was sharing with him regarding the struggling with this bio-mechanical change affecting my right side even though I was happy with feeling a normal arch on the left foot. He was recommending that I should benefit with having the right arch stent reduced a size also. He could see me demonstrate the lack of give of the right arch when it needed to give as I walked; hence a more driving force going up into my right SI joint was being felt. If I truly used the leg properly which meant avoiding any escape of my ankle joint coming inward and/or falling outward of my right hip through lack of Glute muscle control, then pressure was also felt in the lateral arch around the cuboid and the peroneals and the inability to get complete push off from big toe. I wanted to escape because being centered over the right leg felt longer than my left. I had even tried using a few millimeters of more foot lift in my left shoe to make up for this change but that ultimately was not comfortable for my foot in my tennis shoes. Standing still, my heel height between feet was fine just like before surgery, but as soon as my foot was in mid stance of gait that is when I would feel the problems and/or differences between the feet and ultimately up to my hips/ SI joints. On this date, I also had a round of Prolotherapy Injections into the painful SI ligaments by my Osteopathic Doctor in Spokane, Dr. Phillip Lenoue, III. Oct 17th – 18th, 2015, 7 weeks since surgery and now 2 weeks since my horse had arrived, I was finally feeling very positive that the prolotherapy would help my SI ligaments. My left arch burning pain was much better controlled and mostly diminished with some arch padding added to my OTC insoles to make up for the difference I was feeling between the feet. I was able to be out in my horse arena while walking on irregular footing and doing some small amounts of running with the horse. 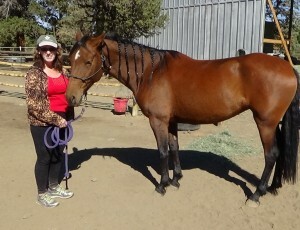 It was a beautiful weekend with my Equine Therapist/friend helping me learn things about training this new horse. Even though the last month had been rough, I felt content and very satisfied that my left foot HyProCure revision was done and over with. Since my bio-mechanical symptoms were not going away and to protect my right ankle and SI joints from being adversely affected by the size 6 stent in my right subtalar joint, Dr. Gent and I agreed to do my right foot HyProCure Revision on Dec. 18th. I wanted to be as strong as I could in my situation before having surgical downtime again. The more I stand correctly over my right foot the more lateral foot pain I continue to feel and I wish that my right foot would already be done by now. 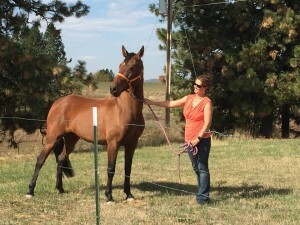 However, I wanted to enjoy my new horse more over the next few weeks before winter would set in. This would give me time to finish the season of conducting our local Christmas community choir and taking care of our annual year end business obligations. I close this blog by saying none of us even knows the next moments of our life. At the end of my wonderful weekend, Sunday night Oct. 18th, a simple accident out in my barn with a tipping over hay bale has now created an addendum to my current medical journey of the HyProCure Revisions. Please stay tuned for the ongoing story or subscribe to my blog updates in “Follow My Journey” Subscription Box in right side bar or footer of this website. I thank everyone that reads my blogs and prays for me as I too pay it forward to many people that contact me personally on my website. Please like SI-Instability.com page on Facebook.